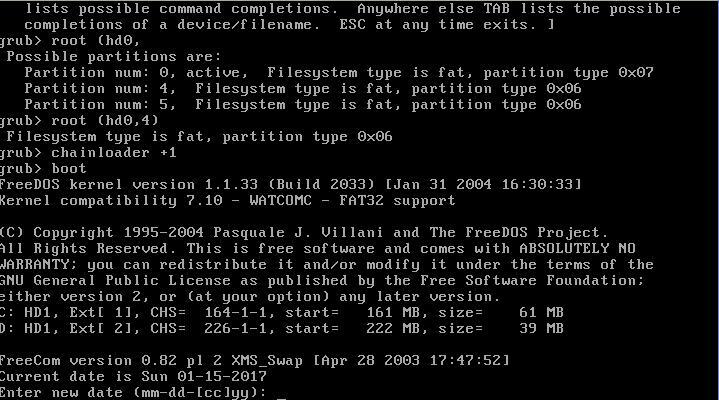 How do you boot freedos in an extended partition? As the title says, can someone tell me how to do this? I've seen numerous times people say that you can install and boot freedos in an extended partition, but they don't say how to do it. I have formatted and sys'd the extended partition. My boot manager will complain IF it doesn't find a valid boot sector. It doesn't complain, so the boot sector is being loaded but thats as far as it gets. What partitions and OS are already on the disk? What disk is it (USB/IDE/SATA). Could you for instance install grub4dos to the MBR? Almost surely you need to correct the "sectors before" or "hidden sectors" in the bootsector, if your "bootmanager" (WHICH one?) uses the bootsector. BUT then it has to be seen if you need some other modification. Is the volume FAT12/16 or FAT32? Also you may be hitting some CHS or LBA limit, please describe in detail what is your setup, understand how the more info you provide the more is likely that someone can find the issue and offer a solution or an alternative. The remap facility looks interesting. I'm not overly familiar with grub4dos. If I had 2 entries in the partition table, 1 for grub4dos partition and an extended full of filesystems, could I map 3 of the filesystems into the partition table? Overwriting one of the existing partition entry? Does it handle un-mapping on next boot, restoring to the original 2 entries again? Edited by mattrix, 15 January 2017 - 09:04 AM. As an experiment, I would make a grub4dos USB boot drive and boot on the target system with it to grub4dos. If it works, you could you could rename kernel.sys to kernel1.sys and copy grldr to L1 and name it kernel.sys. Then Plop would boot to grub4dos and you could use the menu above (in L1 or P1 if that didn't work) and chainload /kernel1.sys. I have never played with logical partition like this, so I don't know if it would work. Maybe Wonko has a better suggestion? I don't know, there is something"wrong", but I am having trouble in understanding the reason. So the first logical starts on LBA 330624+63=330687 (which does correspond to 164/1/1 on a n/32/63 geometry). So the sectors before are 330687. Then there should be the extended partition 63 sectors "void" so that next volume starts on 455616+63=455679, this is also OK with 226/1/1. Now the posted bootsector (which is the one of the 1st logical volume, since it has size 124929 sectors) has instead 00050BBE i.e. 330686 sectors before, which is "wrong" (should be 330687). The other "queer" thing is the 32 head geometry, it is quite rare nowadays, since the overall size is so small, it makes me think of a CF card or similar. This may pose a problem as not all systems/tools/BIOS/etc. will recognize this 32 head geometry. of that partitioning, maybe something is escaping me. Anyway, I will try to replicate your setup and see what comes out of it. Your right, it does look odd, I had to transcribe the partitions by hand. I'm pretty sure about the CHS, but the relative sectors/size do look like I have used wrong figures, from an earlier time: mea culpa. I edited in the 05BBE based on one of the links you sent me. I just got my maths wrong translating 1-based decimal to 0-based hex. In retrospect the grub remapping would have been more robust, provided I can remap 3 partitions safely. So what about systems that don't use the BIOS calls? Edited by mattrix, 15 January 2017 - 12:40 PM. 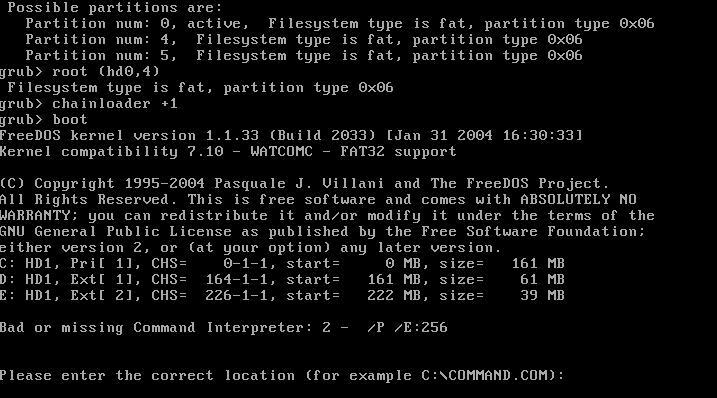 Though you were "lucky" because the first primary partitions have a partition ID that FreeDOS doesn't recognize. Otherwise you would have the wrong drive letter assignments. The map --in-situ one remains the best option (though obviously you have a double mapping) and BTW you don't have to correct the sectors before if you use it.